23/7/08 — Acquisitions — Los Angeles, County Museum of Art — At the last Maastricht Fair the LACMA purchased the Boeckhorst triptych from the Moatti art gallery (see article). We could not discuss it earlier as the acquisition had not yet been finalized. 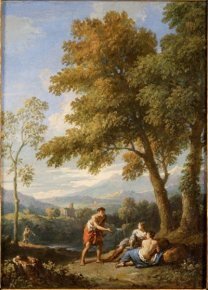 This judicious purchase by the American museum of one of the most beautiful paintings presented at the Fair, on the other hand, represents a regrettable loss for Belgium of a very important work both for its quality as well as for its historical value. The painting is dedicated to Mary Snyders, the wife of the painter Frans Snyders. It was commissioned when she died, in 1659, by her heirs to honor her after her death. A member of the religious order at the Beguinage d’Anvers, Mary Snyders was buried in the church and the triptych was placed above her tomb. In 1798, the church was sold and the work returned to the religious institution where it remained until 2007. Obviously, such a work should never have left the country but it is well known, since Christ’s Entrance into Jerusalem by James Ensor was exported amid general indifference (today at the Getty Museum) as well as the regular sale abroad of works held at the Stoclet Palace, that the protection of national heritage works is not foremost among the Belgian government’s priorities. 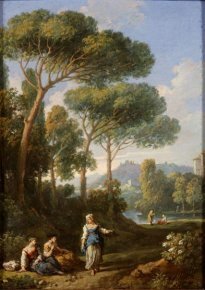 A pair of paintings by Orizzonte has also entered the LACMA collections, which did not hold any works until now by this Flemish landscape artist who worked in Italy during the 18t century (ill. 2 and 3). 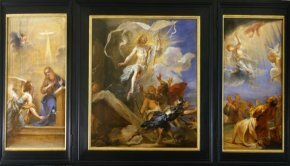 These two small canvases were acquired in London at Sotheby’s on 6 December 2007 for 34,100 pounds (including charges). 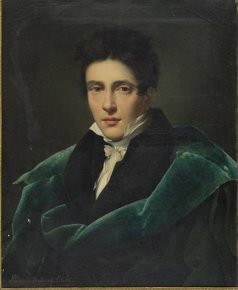 We will conclude this article by pointing out as well the acquisition last year of a very beautiful male portrait by a little-known French painter, Alexandre Dubois-Drahonet (ill. 4) which further enhances the Neo-classical French painting collection at the museum and whose importance was highlighted by Jean-Patrice Marandel, curator for old and 19th century paintings, in the interview which he granted us here at the beginning of the year.